ww2dbaseMineichi Koga was born in Arita, Saga Prefecture, Japan. He graduated from the Japanese Naval Academy in 1906. As a midshipman on the cruiser Matsushima, he visited various countries in or bordering the Pacific Ocean, including United States (Hawaii), New Zealand, Australia, Dutch East Indies, China, and Korea. He was promoted to the rank of lieutenant in 1911. Upon completing the Naval War College courses, he was promoted to the rank of lieutenant commander and subsequently held several shore staff positions. He saw no action during WW1. In 1920, he was posted to France for two years. Upon his return, he was named the executive officer of Kitakami. On 1 Dec 1926, he was promoted to the rank of captain. He would return to France as a naval attaché until being recalled in 1930 to serve as the commanding officer of the Yokosuka Naval Station. 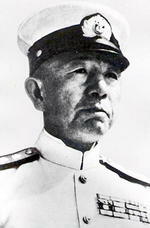 On 31 Dec 1930, he was named the commanding officer of heavy cruiser Aoba. On 31 Dec 1931, he was named the commanding officer of battleship Ise. On 31 Dec 1932, he was promoted to the rank of rear admiral. He was named the head of the Intelligence Division of the Navy General Staff in 1933. On 31 Dec 1936, he was promoted to the rank of vice admiral. ww2dbaseAfter the war began, Koga was named the commanding officer of the 2nd Fleet in 1939. On 1 Sep 1941, he was the head of the China Area Fleet. At the onset of the Pacific War between 9 and 31 Dec 1941, he commanded naval operations in support of the invasion of Hong Kong. After Admiral Isoroku Yamamoto's death in Apr 1943, Koga was named as the new commander-in-chief of the Combined Fleet on 21 May 1943, breaking his flag aboard battleship Musashi. He initially planned aggressive operations in order to give the Japanese Navy the offensive initiative again, but as naval aviation forces dwindled, he could only maintain his forces in a defensive posture, hoping to force a decisive engagement as the Americans conducted their next attack. ww2dbaseIn Mar 1944, during Combined Fleet's withdrawal from Palau Islands to the Philippine Islands, the flying boat which Koga was aboard crashed into the sea during a typhoon. His death was not made public until May 1944 due to war time censorship reasons. He was posthumously promoted to the rank of Fleet Admiral. He now rests at the Tama Reien Cemetery near Tokyo, Japan. 25 Sep 1885 Mineichi Koga was born in Arita, Saga Prefecture, Japan. 1 Dec 1926 Mineichi Koga was promoted to the rank of captain. 31 Dec 1930 Mineichi Koga was named the commanding officer of cruiser Aoba. 31 Dec 1931 Mineichi Koga was named the commanding officer of battleship Ise. 31 Dec 1932 Mineichi Koga was promoted to the rank of rear admiral. 31 Dec 1936 Mineichi Koga was promoted to the rank of vice admiral. 1 Sep 1941 Mineichi Koga was named the head of the China Area Fleet of the Japanese Navy. 21 May 1943 Mineichi Koga replaced Isoroku Yamamoto as the Commander-in-Chief of the Japanese Navy Combined Fleet. 12 Nov 1943 Admiral Mineichi Koga ordered the remaining Carrier Division 1 aircraft at Rabaul, New Britain to be withdrawn to Truk, Caroline Islands. After the departure of Carrier Division 1, Vice Admiral Jinichi Kusaka noted that 11th Air Fleet had the strength of only 202 aircraft, only 110 of which were combat-ready. 31 Mar 1944 Mineichi Koga passed away when the flying boat that carried him from Palau Islands to Philippine Islands crashed into the sea in bad weather.